This article is about the game. For the microgame, see Wario Land (WarioWare: Smooth Moves). 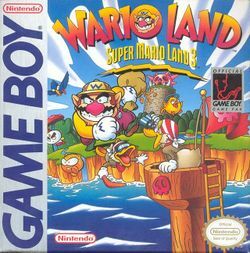 Wario Land: Super Mario Land 3 is a game released for the Game Boy in 1994. It is set apart from the first two Super Mario Land games in that it does not star Mario but instead stars Mario's rival, Wario. This is the third and final installment in the Super Mario Land series and the first installment in the Wario Land series. Mario does make a cameo at the end of this game by stealing a statue of Princess Toadstool from Wario. Desiring to replace or restore the castle he lost to his rival in Super Mario Land 2: 6 Golden Coins, Wario sets out to steal a golden statue of Princess Toadstool from the Brown Sugar Pirates and Captain Syrup, which he then intends to ransom for the money to buy his own castle. Along the way, he collects or steals any other coins and treasures he finds or knocks out of enemies. The game is spent by navigating a number of levels to reclaim his lost treasures, and has a significant level of re-playability due to the branched path that many of the levels take. 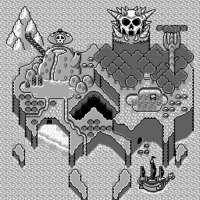 In the end, Captain Syrup (revealed to be female, which was hidden in the instruction manual) is defeated while Wario ultimately gets anything from a birdhouse to an actual planet or moon for himself based on the amount of treasure collected as compensation for failing to steal the statue (due to Mario retrieving it by airlifting it). Wario Land: Super Mario Land 3 introduces a new mechanic where the ending is determined by the amount of coins that Wario has collected in the game. The more coins and treasures he collects, the better his new home will be. Wario jumps in and out of a body of water while avoiding some common enemies: a Watch and a Pinwheel. Wario Land: Super Mario Land 3 is a 2D platforming game. It is divided into seven worlds, which each are divided into multiple courses. In most courses Wario has to trade in ten of his coins for one big 10 Gold Coin to open the door to the next course. Once the player completes a course, the next course will become available, and so on. The game also allows players to revisit levels that have already been completed. It has several mechanics that are similar to the Super Mario games such as the transformation system. Wario can also touch enemies as long as they don't have any hazards equipped, so he can stun or defeat them by performing a Body Slam, ground pound, touching soft-spots, or tossing at others. One of the main features in Wario Land is the various transformations that Wario can go through by collecting a Power Up Pot. These special powers can at times help Wario overcome obstacles and defeat tough enemies; however, if Wario takes damage when in any of the first three transformations, he will transform into Small Wario, who dies instantly upon taking damage. Bull Wario - Wario can transform into Bull Wario by obtaining a Bull Pot or a Garlic Pot (in normal form). In this form, Wario can destroy his enemies and blocks much easier. Wario can also create a shock wave by crashing into the ground with his weight, and stick to the ceiling. Dragon Wario - Wario transforms into Dragon Wario by obtaining a Dragon Pot. Upon obtaining the power-up, he wears a dragon-like helmet on his head, which allows him to momentarily spew fire from it. The fire works underwater as well, though instead of fire, the helmet shoots arrow-like projectiles. Unlike other forms, Wario cannot perform a Body Slam when wearing the hat. Jet Wario - By obtaining a Jet Pot, Wario wears a plane-like helmet on his head, which allows him to glide for a while. He gradually descends until touching the ground, in which he can start walking again. Wario also walks more quickly and jumps higher with this item. Small Wario - Wario transforms into Small Wario if damaged. He is then not able to Body Slam, and taking more damage results in loss of a life. Small Wario can transform back into regular Wario by finding a Garlic Pot or by completing a level. He can transform directly to Bull, Dragon, or Jet Wario by finding the applicable pot. Each world has a boss that Wario must defeat at the end. Here is a listing of the bosses in order, and which world they correspond to. Wario will not be able to fight bosses again once they are beaten. Spiked Pirate Rice Beach Spiked Pirate is a Koopa enemy protected by spiky armor. In his fight with Wario, he employs a three-pronged attack of striking from land, air, and underground. His shell makes him invulnerable to ground pounds and fire. However, he can be rammed into, exposing his soft belly. After three hits to his vulnerable underside, he is defeated. Bīfun Mt. Teapot Bīfun is immune to head stomps and ground pounds, due to his horns and thick hide. He attempts to destroy Wario by picking him up and throwing him into the lava below their battleground. To defeat him, Wario has to throw him into the lava instead. Hinyari Sherbet Land Hinyari is a large and bulky penguin that wields two vicious spiked boxing gloves, which he uses to punch Wario. He is immune to ground pounds and fire, but Wario can hurt him by hitting his head. He then dons a spiked helmet, but Wario can simply knock it off with a slam and then attack the penguin. Funfun Stove Canyon Funfun is a giant stone head whose fighting style revolves around breaking blocks with his tongue, trying to get Wario to fall into a chasm, and spitting rocks. Funfun is immune to fire, coins, and ground pounds, but the rubble his attacks leave behind are picked up by Wario and thrown at him to defeat him. Bobo SS Tea Cup Bobo is a giant bird which sends out two Watches to attack Wario. He must jump on top of a Watch and toss it at Bobo three times before Bobo is defeated. Zenisukī Parsley Woods Zenisukī can paralyze Wario by touching him, and is immune to head stomps, coins, and fire. Zenisukī also turns invisible and drops coins that transform into Yarikuri Obake to attack Wario. Wario can defeat Zenisukī by tossing his Yarikuri Obake minions at him. Genie Syrup Castle The Genie produces fireballs that chase Wario around. However, Wario can toss the Genie's magic lamp so that it lands upright, producing a small cloud. Wario can ride this cloud and leap from it to pounce on the Genie's head. The cloud then turns into a miniature version of the Genie that blasts lightning bolts, but the mini-Genie is easily destroyed. After enough hits on the head, the Genie is defeated. Batto Shuruken A hawk-like statue resembling a Mask Gate, which shoots Kōmori Missiles. Bē A bashful insect that flees from Wario whenever he gets too close. Big A large round fruit that falls from above and rolls towards the player. Bōtsu Fiery objects that emerge from lava like Lava Bubbles do. Bucket Head An ill-tempered snowman that spits out icy flakes at Wario, in an attempt to hurt him. Chicken Duck A non-aggressive creature that, when an enemy is thrown at it, will fly away while dropping large coins. D.D. A sailor-costumed duck that hurls boomerangs at Wario. Demon Bat A bat enemy which swoops towards Wario in an attempt to damage him with its pointy tail. Dropper A spiky enemy that clings to the ceiling and falls when Wario gets below. It is only dangerous when falling. Floater Although not considered an enemy, it can carry Wario across large chasms. Gaugau A thug animal that hurls knives at the player. Goboten A seal enemy that carries a harpoon while swimming underwater. Guragura A mole that spins a mace. Harisu A hedgehog enemy with retracting quills. Helmut An underwater jellyfish that wears a spiny helmet. It is vulnerable from the bottom. Konotako A flying bomb that sticks to Wario and detonates after a few moments. Kōmori Missile An incandescent projectile, in an appearance similar to those of Lava Bubbles, shot by a Batto Shuruken. Maizō A money loving crustacean who will flee if forced from under the sand. Munchers Invulnerable carnivorous plants that stick to the ground and wait for some prey. Paidan A Hoopster-mannered arachnid that clambers ropes and ladders. Pecan A swimming pirate pelican that spits mines which explode after a short time. Penkoon A robust penguin-raccoon hybrid that rolls small dangerous boulders at the player. Pikkarikun A thundercloud entity whose only attack method is dropping electric bolts. Pillars Perilous underwater threats for Wario; some are vertical and spiky, some are horizontal and not prickly. Pinwheel A seahorse that curls and spins whenever Wario touches it. It possesses an array of sharp blades, found on its back. Piranha Plants Much like Munchers, they are rooted in the ground and continuously crunch thin air. They can instantly defeat Wario upon contact. Pirate Goom A spear-holding enemy. Unlike the Wanderin' Goom, it might harm the player using his weapon. Pouncer A stone creature whose behavior and appearance resembles that of a Thwomp, as it usually plummets from up above and attempts to squish the protagonist, as well as other wandering beings, although they also travel along preset paths. Sparky A electric spiked ball that travels along walls. Spiked Balls Large prickly balls that plummet from the thickets of Parsley Woods. Togemaru A bouncing spiked creature with a soft underbelly. Ukiwani A disinterested-looking crocodilian that floats at the surface of water. It leaps and munches Wario whenever he gets above it. Wanderin' Goom A tiny and meek enemy that wanders around and cannot harm Wario. Watch A rash bird that swoops down to Wario. White puff A puffy creature that inflates itself whenever Wario makes contact with it. Knight A knight duck who guards the door to the final room. Yadorā A hermit crab that possesses a prickly shell. It points one of its claws in the direction it walks. Yarikuri Obake The ghost of a Pirate Goom. Although it didn't sell as well as its Mario Land predecessors, the game received mostly favorable reviews. The game placed 71st in the 100th issue of Nintendo Power's "100 best Nintendo games of all time" in 1997. Nintendo 3DS Corbie Dillard, Nintendo Life 9/10 "It would be quite easy to make a case for either Super Mario Land 2: 6 Golden Coins or Wario Land as the original Game Boy system's best platforming experience, but given how different the two titles are it almost seems unfair to compare them directly. With Wario Land, Nintendo completely reinvented its portable platformer and gave its greedy new character his own game, instead of merely plopping him down into the middle of another standard Super Mario Land presentation. A wealth of new gameplay features combined with a unique visual and musical style make this title stand on its own, and at £3.60 on the Virtual Console it gives old and new fans of the previous Super Mario Land releases a fresh spin on the series. If you want to experience some of the best platforming the Game Boy system has to offer, you needn't look any further than this release." Nintendo 3DS Travis Fahs, IGN 7.9/10 "The fact is, Wario Land never works completely. It is a very easy game that hasn't quite found its direction, and yet it packs the tiny Game Boy screen with as much personality as anything else Nintendo had put out. Wario was simply born to be a star, and he doesn't have to bring any wanna-be in blue overalls with him anymore. Wario Land marked the end of original handheld Mario games until 2006's New Super Mario Bros. and as long as Wario was there, I could hardly miss him." The game spawned five sequels, Virtual Boy Wario Land, Wario Land II, Wario Land 3, Wario Land 4 and Wario Land: Shake It!. The Wario franchise also received Wario World and Wario: Master of Disguise which were similar games. A spin-off series was also made, the popular WarioWare series of games. Mario franchise - The game's first boss is considered a variety of Hammer Brother. A statue of Princess Toadstool serves as the game's MacGuffin, and Mario himself makes an appearance during the ending. The way blocks and forms work, which would be dropped in the Wario Land games after Virtual Boy Wario Land, is taken from the Mario franchise as well. Super Mario Land 2: 6 Golden Coins - Bē from this game's Tree Zone make an appearance on the SS Tea Cup, one of the few aspects from the original Super Mario Land duology to carry over into Wario Land. Mario Party 2: Wario's helmet is reused for his Mystery Land costume in this game. Luigi's Mansion: The game's various endings regarding what mansion Luigi has depending on how the player completed the game is similar to in this game. WarioWare, Inc.: Mega Microgame$! : The microgame Grow Wario Grow features the Tiny Wario and regular Wario sprites. Wario World: Just like with this game, the player's castle in the ending varies by how they completed the game. WarioWare: Smooth Moves: A microgame called Wario Land is one of 9-Volt and 18-Volt's microgames. Super Smash Bros. Brawl: Masahiro Sakurai stated on the website that the WarioWare section of All-Star mode was put to match the time Wario was the main character in Wario Land: Super Mario Land 3. Mario Kart 7: Part of the music that plays on Wario Shipyard is an arrangement of the music of the first stage of Rice Beach, and a painting of Bull Wario can be seen on a billboard. Mario Party 10: Wario's hard hat is seen in the background of his own personalized amiibo-exclusive board. Super Mario Maker: When transforming into Wario's Costume Mario costume after collecting a Mystery Mushroom, the transformation sound effect after collecting a Power Up Pot can be heard. The "lose a life" theme and the tune heard at the minigame selection screen after clearing a course also play after falling into a pit or lava and clearing a level as Wario, respectively. In Course No. 38, it is possible to get a Guragura trapped within the giant ! Block at the end by throwing it at it. For this subject's image gallery, see Gallery:Wario Land: Super Mario Land 3. The game was tentatively titled Super Mario Land 3: Kairiki Wario (スーパーマリオランド3 怪力ワリオ), kairiki meaning "super-strong". The name was used on a Japanese promotional flyer from 1993. The logo depicted on the flyer differs drastically from any of the Wario Land logos. Despite being released in 1994, the game instead carries a 1993 copyright in the ROM itself and on the back of the North American box, implying that the game was originally planned for release late that year and then pushed back. This game borrows some sound effects used in Metroid II: Return of Samus, another Game Boy game developed by Nintendo R&D1. One example is when a boss is hit; the noise is the same one made when a Metroid gets hit. Other borrowed sound effects are when the player pauses the game and the sound of triggering mines which is the same as Samus going into Morph Ball. The manual states that the Select button is "Not used." However, the player can enter a cheat mode by pressing that button sixteen times on the pause screen. Holding down the and button simultaneously will allow them to alter the numbers on the status bar as well as power up Wario. The Japanese title refers to the game as being the third installment in the Super Mario Land series, however the name was reversed in the Western versions as this is rather the first game in the Wario Land series. ↑ Promotional flyer for Super Mario Land 3: Kairiki Wario, from a collection of Japanese video game promotional flyers on Yahoo Japan Blog. This page was last edited on April 24, 2019, at 20:22.